Life in the Valley: Blog Series, Coming Your Way in November! The last few years I've joined with many in cyberspace and blogged daily in October or November. * The first year, 2010, I simply wrote about something on my mind or what we did that day. In 2011 and 2012 I got more serious and picked a topic and worked my way through it, forcing you inviting you to join with me. Getting fancy around here, isn't it?! For 2013 I've got an idea brewing that I wanted to get started today, October 1, but wisdom's telling me to hold off till November. You've surely read about our move and my husband's new job. Well, he's busy with his first semester teaching, which means I'm far more busy at home than I usual. I won't have time to devote to developing the topic as I go this month, but if I spend this month reading and preparing, it will be much more manageable to invite you along for the ride in November. [God] has saved us and called us to a holy life - not because of anything we have done but because of his own grace. This grace was given us in Christ Jesus before the beginning of time, but it has now been revealed through the appearing of our Savior, Christ Jesus, who has destroyed death and has brought life and immortality to light through the gospel. 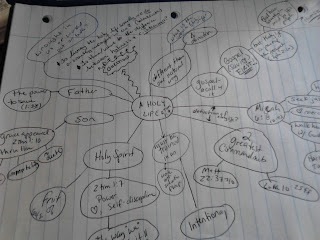 I run in circles that (I believe) rightly spend a lot of time focusing on the grace of God in saving us. As these verses say, God saves us not because of what we've done, but because of His own grace. Amen to that! However, that's not the only thing that Paul says to Timothy. He adds that God saved us and called us to a holy life. I want to know what that means! What does that look like day-to-day? How do we lean wholly on Jesus' name and pursue this calling to a holy life? I have so many questions, and I want to search out some answers! That is what November will be all about at Life in the Valley. 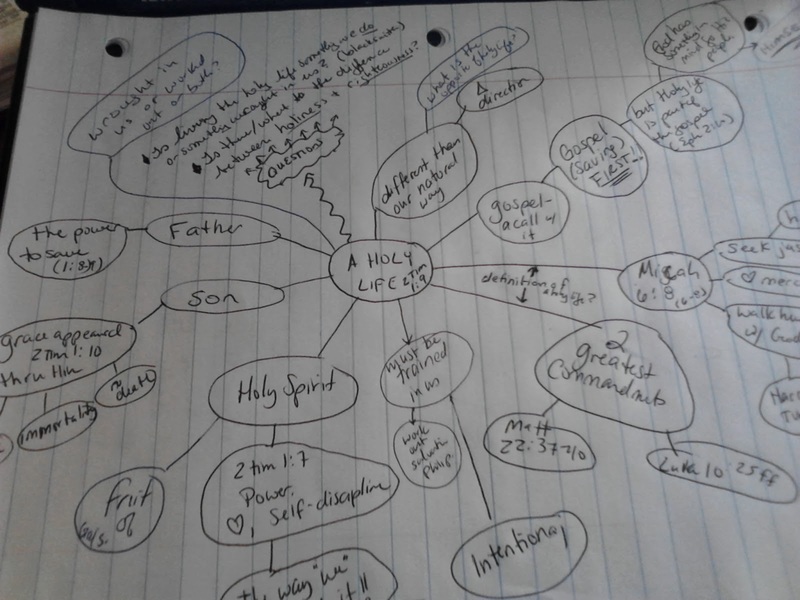 I've been mind-mapping, coming up with questions, and reading an old book, by a fellow named William Law, called A Serious Call to a Devout and Holy Life. I'm also thinking about how the holy life relates to and/or is defined by the two greatest commandments, Micah 6:8, and the fruit of the Spirit. I wonder, is the holy life something we do or something that is wrought in us? Or both?! Is there a difference between holiness and righteousness? How can we keep from relying on works-righteousness but also not feel like Christ set us free to do what ever we want? I believe the Scriptures have answers to these questions. I hope we find ourselves surprised by some of them! Please join me in November for this exploration and invite your friends. I'm fairly certain we'll just scratch the surface, but I pray it will cause us to grow up together into the Head, who is Christ. Also, if you have read any good books or can think of any verses/passages that relate to this topic, I'll take any and all suggestions. *I got the first image from http://www.theroadtorollergirl.com/tag/nablopomo/. The link feature isn't working at the moment. Yay, looking forward to this! Glad you waited until November as I am supposed to be fasting from blogs in October (you can see how well my self-control is working). Go Pirates!